With daily en primeur release alerts and offers for the new 2017 vintage filling our inboxes, the “Bordeaux buzz” at this time of year is undeniable. However, Bordeaux’s popularity does not end with en primeur, as we prove with results of the last quarter’s trading volumes. Wine Lister uses figures collated by the Wine Market Journal from sales at the world’s major auction houses to calculate incremental increases in four-quarter trading volumes – in this case, January-December 2017 versus April 2017-March 2018. Auction volumes contribute towards Wine Lister Economics scores, allowing us to measure the liquidity of each wine. The five wines showing the biggest increases in trading volumes between these two periods all hail from Bordeaux. Indeed, such is the case for the top 20 auction volume increases, with the exception of brand royalty, Dom Perignon (in 10th place). The wine experiencing the biggest increase in trading volumes is Mouton Rothschild, with 778 additional bottles traded. It has the highest Economics score of the five (956) and a compound annual growth rate (CAGR) of 11.3%. Kicking off the first growth releases of 2017 vintages this week, Mouton Rothschild’s 2017 UK release price sits 17% below last year’s at £360 per bottle. In second place is right bank powerhouse, Cheval Blanc, whose trading volume increased by 685 bottles with the addition of the most recent quarter’s figures. Though second for incremental change, its total trading volume is at least 30% smaller than any of the left bank first growths. Latour and Haut-Brion come in third and fourth place, both with 12% trading increases of 614 and 529 respectively. Finally, trades of Pape Clément keep the Pessac-Léognan property’s red in the top five for trade increases for a consecutive quarter, with 506 more bottles traded in the current period. 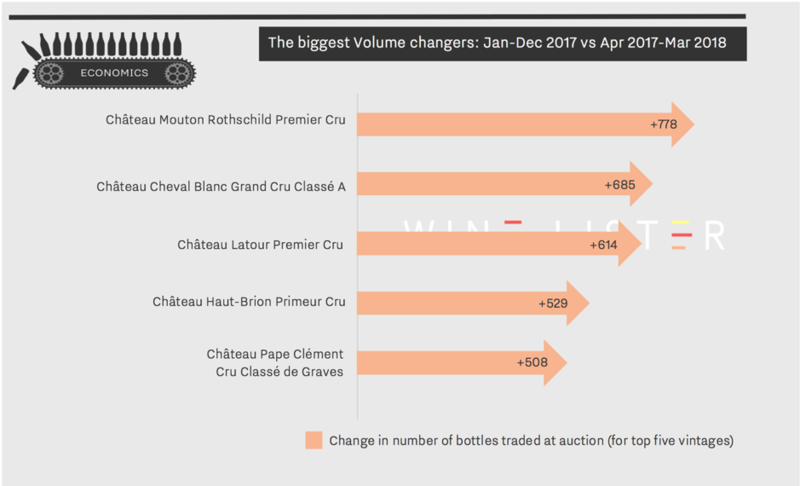 Despite dropping four places since last quarter’s auction volume results, Pape Clément still achieves the highest proportional change of all five wines at the top, with a 27% trading volume increase.